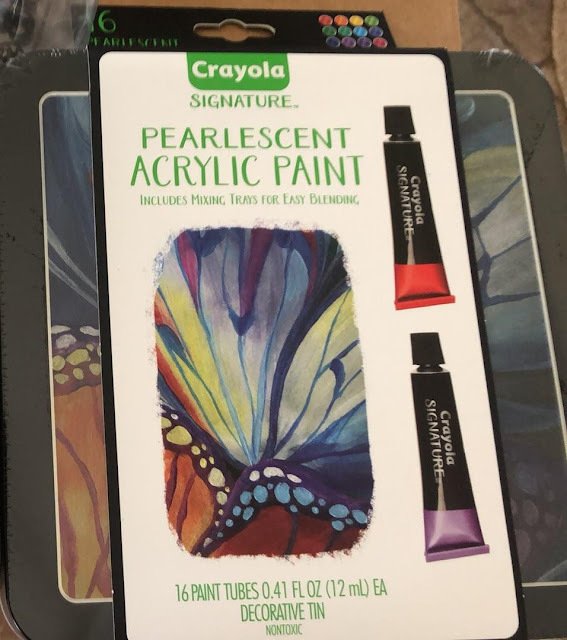 Crayola sent me two awesome products to review. 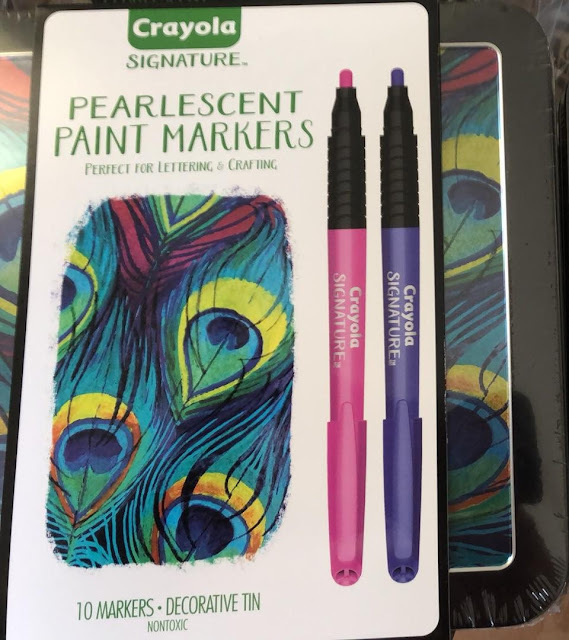 They are the Pearlescent Acrylic Paint and the Pearlescent Paint Markers. Both from the Crayola Signature Series and can be purchase from the Crayola site. First we have the Crayola Signature Pearlescent Acrylic Paint. There are 16 vibrant colors that have a shimmering gloss finish. The paints have a multidimensional pigment that offers superior coverage. It comes with three mixing trays for easy blending and is contained within a decorative storage tin. Each tube of paint is 12 ml. They will work on a variety of surfaces including foam, canvas, wood, plastic and even construction paper. The darker the surfer, the better it looks. This is a safe and non toxic paint for adults and teens 14 and over. You can buy it on the crayola site right now for $14.99. This is Crayola Signature Pearlescent Paint Markers. It comes with 9 pearlescent markers and 1 iridescent one. They bring a satin finish to a variety of surfaces. They are quick drying and can be used on glass, plastic, wood, terracotta, canvas and metal. Overlap the iridescent color changer to add dimension and special effects. Looks best on a darker background. They also come in a decorative storage tin. The tin is beautifully decorated with peacock feathers. This would make a safe and non toxic gift for any adult or teen age 14 and above. You can buy the paint markers right now at the crayola site for $17.99. Either one of these would make an excellent gift for any teen or adult who loves painting. They would be perfect for Easter, so why not buy both!